In this work, it is aimed to improve the device performance of traditional Au / n-Si Schottky Diodes (SDs) with an innovative approach using the irradiated PTCDA interfacial layer. For this reason, first PTCDA powders were irradiated with different electron beam (E-Beam) doses of 30kGy, 60kGy and 100kGy and the results were analyzed by FTIR method. Unirradiated and irradiated PTCDA powders with E-Beam were evaporated on n-Si substrate via organic evaporator. Current-Voltage (I-V) characteristics of unirradiated and irradiated Au/PTCDA/n-Si SDs with PTCDA interfacial layers irradiated with different E-Beam doses of 30kGy, 60kGy and 100kGy were carried out between ±3V at room temperature. The ideality factor (n), Schottky barrier height (FBo), rectification ratio (DO), series resistance (Rs) and shunt resistance (Rsh) of devices were calculated from current-voltage (I-V) results. It is experimentally seen that performance of Au/PTCDA/n-Si SD irradiated with 30 kGy has better results when we compared unirradiated Au/PTCDA/n-Si SD. It has been observed that the I-V characteristics of the Au/PTCDA/n-Si SD are highly influenced by irradiation and the device performance can be improved with appropriate irradiation dose. Bu çalışmada, geleneksel Au/n-Si Schottky Diyotların (SDs) aygıt performansının ışınlanmış PTCDA arayüzey tabakası kullanılarak yenilikçi bir yaklaşımla iyileştirilmesi amaçlanmıştır. Bu nedenle ilk olarak PTCDA tozları 30kGy, 60kGy ve 100kGy farklı elektron demet (E-Demet) dozlarında ışınlanmıştır ve sonuçlar FTIR yöntemi ile analiz edilmiştir. Işınlanmamış ve ışınlanmış PTCDA tozları n-Si alttaş üzerine organik buharlaştırma sisteminde kaplanmıştır. Farklı dozlarda E-Demet ile ışınlanmış ve ışınlanmamış PTCDA arayüzey tabakalı Au/PTCDA/n-Si SD’ların Akım-Gerilim (I-V) karakteristikleri ±3V arasında oda sıcaklığında gerçekleştirilmiştir. Aygıtların idealite faktörü(n), Schottky engel yüksekliği (FBo), doğrultma oranı (DO), seri direnç (Rs) ve Şönt direnci (Rsh) parametreleri I-V sonuçlarından hesaplanarak elde edilmiştir. 30 kGy ışınlanmış PTCDA arayüzey tabakalı Au/PTCDA/n-Si SD aygıt performansının ışınlanmamış PTCDA arayüzey tabakalı Au/PTCDA/n-Si SD’a göre daha iyi olduğu deneysel olarak gözlenmiştir. Au/PTCDA/n-Si SD’un I-V karakteristiklerinin ışınlama ile oldukça etkilendiği ve uygun ışınlama dozu ile aygıt performansının artırılabileceği gözlemlenmiştir. Sze S.M., Physics of Semiconductor Devices, John Wiley and Sons, New York, (2007). Aydemir U., Taşçıoğlu İ., Altındal Ş. ve Uslu İ., A detailed comparative study on the main electrical parameters of Au/n-Si and Au/PVA:Zn/n-Si Schottky barrier diodes. Materials Science in Semiconductor Processing 16(6): 1865-1872 (2013). Ocaya, R.O, Al-Sehemi, A.G, Al-Ghamdi, A, El-Tantawy, F, Yakuphanoglu, F, Organic semiconductor photosensors. Journal Of Alloys And Compounds 702: 520-530 (2017). Gupta R, Misra S.C.K., Malhotra B.D., Beladakere N.N., Chandra S., Metal/semiconductive polymer Schottky device. Appl. Phys. Lett. 58: 51, (1991). Xu Y,, Sun H.,Noh Y.Y., Schottky Barrier in Organic Transistors. IEEE Transactions On Electron Devices 64(5): 1932-1943 (2017). Çakar M., N. Yıldırım, Ş. Karataş, C. Temirci, A. Turut, Current-voltage and capacitance-voltage characteristics of Sn/rhodamine-101∕ n-Si and Sn/rhodamine-101∕ p-Si Schottky barrier diodes. J. Appl. Phys, 100: 74505 (2006). Gupta R.K. ve Singh R.A., Electrical properties of junction between aluminium and poly(aniline)–poly(vinyl chloride) composite, Mater. Chem. Phys. 86: 279, (2004). Kılıçoğlu T., Aydın M.E., Topal G., Ebeoğlu M.A., Saygılı H., The effect of a novel organic compound chiral macrocyclic tetraamide-I interfacial layer on the calculation of electrical characteristics of an Al/tetraamide-I/p-Si contact. Synth. Met. 157: 540 (2007). Güllü Ö. ve Türüt A., Electrical analysis of organic interlayer based metal/interlayer/semiconductor diode structures. J. Appl. Phys. 106: 103717, (2009). Akkılıç K., Aydın M.E., Uzun İ., Kılıçoğlu T., The calculation of electronic parameters of an Ag/chitin/n-Si Schottky barrier diode Synth. Met., 156: 958, (2006). 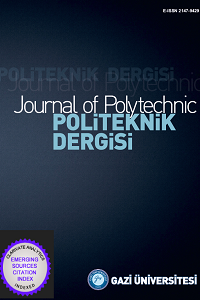 Aydın M.E., Kılıçoğlu T., Akkılıç K., Hoşgören H., The calculation of electronic parameters of an Au/β-carotene/n-Si Schottky barrier diode. Physica B 381: 113, (2006). Güllü Ö., Aydoğan Ş., Türüt A., Fabrication and electrical properties of Al/Safranin T/n-Si/AuSb structure. Semicond. Sci. Technol. 23: 075005 (2008). Kuo C.S., Wakim F.G., Sengupta S.K., Tripathy S.K., Schottky and Metal-Insulator-Semiconductor Diodes Using Poly(3-hexylthiophene) Jpn. J. Appl. Phys. 33: 2629 (1994). Narayanan Unni K N., Dabos-Seignon S., Nunzi J.M. Improved performance of pentacene field-effect transistors using a polyimide gate dielectric layer. Journal of Physics D: Applied Physics, 8(1): 1148 (2005). Faraji S, Hashimoto T, Turner M L and Majewski L A Solution-processed nanocomposite dielectrics for low voltage operated OFETs Organic Electronics, 17 :178 (2015). Chime A. C., Bensmida S., Chakaroun M., Lee M. W. Nkwawo H.,Fischer A. P. A., Electrical modelling and design of ultra-fast micro-OLED with coplanar wave-guided electrodes in ON-OFF regime. Organic Electronics 56: 284-290, (2018). Chang-Chun, L., Yan-Shin S.,Chih-Sheng W., Chia-Hao T., Shu-Tang, Y., Yi-Hao P.,Kuang-Jung C., Development of robust flexible OLED encapsulations using simulated estimations and experimental validations. Journal of Physics D: Applied Physics 45(27): 275102 (2012). Kampen T., Schuller A., Zahn D.R.T., Biel B., Ortega J., Perez R., Flores F., Schottky contacts on passivated GaAs(100) surfaces: barrier height and reactivity. Appl. Surf. Sci. 234: 341 (2004). Uslu, H, Yildirim, M, Altindal, S, Durmus, P, The effect of gamma irradiation on electrical and dielectric properties of organic-based Schottky barrier diodes (SBDs) at room temperature. Radiation Physics And Chemistry, 81(4): 362-369, (2012). Dökme, İ. , Altindal, Ş. and Uslu, İ., The effects of temperature, radiation, and illumination on current–voltage characteristics of Au/PVA(Co, Zn‐doped)/n‐Si Schottky diodes. J. Appl. Polym. Sci., 125: 1185-1192, (2012). Al-Ta’ii, H., Periasamy V., Iwamoto M. Irradiation effects on electrical properties of DNA solution/Al Schottky diodes. Applied Physics A, 124(4): 325, (2018). Şahin Y., Aydoğan Ş., Ekinci D., Turut A., The performance of the anthraquinone/p-Si and the pyridine/p-Si rectifying device under X-ray irradiation. Materials Chemistry and Physics 183: 516-523, (2016). Liao Y., Weber J.,Faul C.F.J, Fluorescent Microporous Polyimides Based on Perylene and Triazine for Highly CO2‑Selective Carbon Materials, Macromolocules, 48 (7): 2064-2073, (2015). Farag, AAM; Osiris, WG, Yahia, IS, Photovoltaic performance analysis of organic device based on PTCDA/n-Si heterojunction. Synthetic Metals, 161(17-18): 1805-1812, (2011).